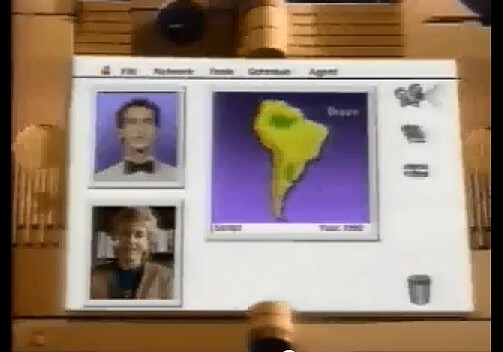 Back in 1987 during the era of John Sculley, Apple released a “what if” video describing a device called the Knowledge Navigator. This prescient work anticipated a personal digital assistant a la Siri, a touch screen tablet computer like the iPad, videoconferencing (FaceTime) and more. In this groundbreaking piece – set in then futuristic 2006 2011 – the assistant isn’t a woman’s voice but a male talking head in a white tuxedo. Users interact with the Knowledge Navigator through normal conversation and manipulation of objects on a touchscreen. The device is connected to all the world’s major networks, offers two-way videoconferencing with colleages, and helps manage your personal affairs and appointments. Data can be shared online or via an insertable memory card – something the iPad still lacks! With Apple’s announcement of Siri, the pending release of iCloud, and the established technologies of the iPad, iPhone and FaceTime, Apple may have finally arrived at this vision from 1987 – and one from a leader (Sculley) derided by many as visionless, to boot. Ideas don’t spring forth from Apple out of nothingness, some have very long gestation periods!